A self-healing, water-repellent, spray-on coating developed at the University of Michigan is hundreds of times more durable than its counterparts. It could enable waterproofing of vehicles, clothing, rooftops and countless other surfaces for which current waterproofing treatments are too fragile. It could also lower the resistance of ship hulls, a step that would reduce the fuel consumption of the massive vessels that transport 90 percent of the world's cargo. The developers say the new concoction is a breakthrough in a field where decades of research have failed to produce a durable coating. While water-repellent finishes are available at present, they're typically not strong enough for applications like clothing or ship hulls. This discovery changes that. 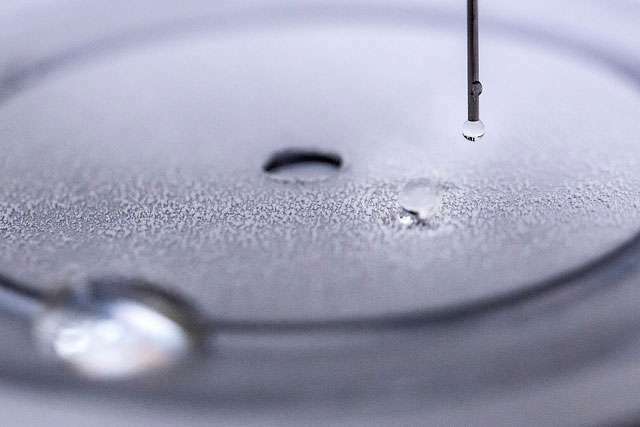 "Thousands of superhydrophobic surfaces have been looked at over the past 20 or 30 years, but nobody has been able to figure out how to systematically design one that's durable," said Anish Tuteja, U-M associate professor of materials science and engineering. "I think that's what we've really accomplished here, and it's going to open the door for other researchers to create cheaper, perhaps even better superhydrophobic coatings." The coating is made of a mix of a material called "fluorinated polyurethane elastomer" and a specialized water-repellent molecule known as "F-POSS." It can be easily sprayed onto virtually any surface and has a slightly rubbery texture that makes it more resilient than its predecessors. If it is damaged, the coating can heal itself hundreds of times. It can bounce back "even after being abraded, scratched, burned, plasma-cleaned, flattened, sonicated and chemically attacked," the researchers wrote in a paper recently published in ACS Applied Materials & Interfaces. In addition to recovering physically, the coating can heal itself chemically. If water-repellent F-POSS molecules are scraped from the surface, new molecules will naturally migrate there to replace them. That's how the coating can renew itself hundreds of times. Its healing ability is limited only by its thickness. The discovery is being commercialized by HygraTek, a company founded by Tuteja with assistance from U-M Tech Transfer. Beyond the coatings detailed in the paper, the project produced what amounts to a recipe that researchers can use to optimize future coatings to a specific application's requirements for cost, durability and other factors. "Most materials science researchers have focused on identifying one specific chemical system that's as durable and water-repellent as possible," he said. "We approached the problem differently, by measuring and mapping out the basic chemical properties that make a water-repellent coating durable. And some of the results surprised us." For example, most hydrophobic coatings are made of two main ingredients: an active molecule that provides the water-repellency and a binder. Generally, researchers have assumed that using more durable ingredients would make a more durable coating. But Tuteja's team found that that's not necessarily the case. They discovered that even more important than durability is a property called "partial miscibility," or the ability of two substances to partially mix together. The other key variable the team discovered is the stability of the water-repellent surface. Most water-repellent coatings work because their surface has a very specific geometry, often microscopic pillars. Water droplets perch on the tips of these pillars, creating air pockets underneath that deny the water a solid place to rest and cause it to roll off easily. But such surfaces tend to be fragile—slight abrasion or even the pressure of the water itself can damage them. The team's research found that a surface that's slightly pliable can escape this pitfall—even though it seems less durable, its pliable properties enable it to bounce back from damage.